If you are interested in an aviation-related career involving flight operational support, then the Aviation Management degree is for you. This could involve working in a corporate flight department, or managing a flight school, or working in flight support operations at an airline or in the aircraft maintenance or manufacturing industry. This degree does not require flight training and is focused on providing you with a fundamental knowledge of flight concepts and terminology pertaining to meteorology, aircraft systems, airline operations, and flight safety practices. If you already have a degree in another field but want some background in aviation and flight operations, then you can do one or both of the certificate options. Option A covers management principles, aircraft systems and basic flight operations. Option B covers aviation operations management, flight safety principles, air transportation industry specifics, supply chain management and aircraft structures. 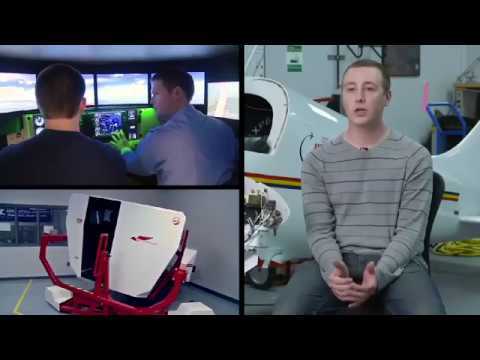 How do I know whether to enroll in the Career Pilot or Aviation Management Program? If you look at the catalog descriptions for the two programs, you will see that there are many classes that are common to both degrees. If you want to fly and have the financing available to complete the flight training in 2-3 years, then the Career Pilot degree awards you the most credit for your flight training and would be the most efficient way to the Associate's Degree. If you are unsure about getting the financing for flight training or how quickly you can progress toward your commercial license, then we recommend enrolling in the Aviation Management degree. You can still do your flight training on the side, but it would allow you a way to attain a degree even if you don’t complete your commercial certificate in two years. We have three: Redbird, FMX full-motion, and AATDs. These can be scheduled with a GTCC flight instructor. These are scheduled through continuing education and are available to curriculum students and individuals outside of GTCC who want to purchase simulator time to train for a new certificate, improve proficiency, or meet currency requirements. The outlook is great. The aviation industry is growing to satisfy demand generated by global economic expansion. Use Indeed.com or JSFirm to search local and regional jobs for “Aviation Management” in Greensboro in Winston Salem , and for North Carolina overall.